In the period after the war, the artist resumed his rudely interrupted career. 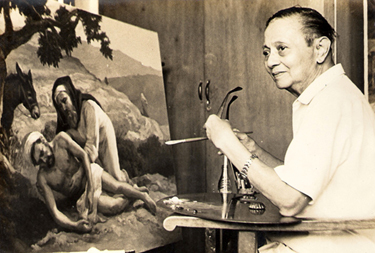 The next two decades saw the blossoming of Amorsolo’s art. He went back to painting the bright sun-drenched countryside scenes for which he was most well-known. He reached the peak of his popularity in the late 1940’s and 1950’s garnering numerous awards and citations along the way. Amorsolo was widely recognized as the most influential artist of his time. The end of the war saw the Philippines gain its independence from the United States. As a young republic it was seeking its own national identity. Amorsolo’s work was naturally seen as the embodiment of a Filipino culture unique from that of the new country’s former colonial masters. His genre paintings were in such high demand that he catalogued his works. Prospective clients would choose the painting they wanted. The artist then painted a different version of the chosen subjects. Amorsolo’s prodigious output was helped in no small way by the speed with which the artist was able to finish his work. His strokes were so sure and true that he was able to finish a painting in a significantly shorter period of time. It is believed that the oil paintings that he produced number into the thousands. If his drawings, sketches, and studies are added, his total output was in excess of ten thousand pieces. At one point, he was able to finish no less than ten paintings in a typical month. Part of the motivation for this incredible pace was the need to support his large family. The artist was roundly criticized for his machine-like efficiency. Furthermore, a blossoming modern art movement, who considered Amorsolo the de facto leader of the classical realist school, saw him as a natural target. He never raised his voice nor took up the cudgel in his own defense yet he had no shortage of defenders who took up the fight. Among his staunchest supporters was Guillermo Tolentino, the finest sculptor the country ever produced and Amorsolo’s best friend. When asked why he did not speak up in his own defense, the artist responded with a shrug and said that he had already matured as an artist. He had nothing left to prove and was comfortable painting what he wished in the form of expression that he chose. His customers stood by his side and demand for his paintings remained high.